Editor’s note: No gleeing about the UK, the property devil knows no borders. Let us begin our story with the, ahem, relatively good news. That something in the air is of course a long established science, turning customers into manipulatable objects with wallets. However, sometimes supermarkets go one step too far, something witnessed by the UK’s largest consumer body "Which? ", who last week made a so-called super complaint to the British competition regulator, allegating that UK supermarkets are duping consumers through misleading price tactics, all according to reports by the UK daily The Guardian. One of the illusions, Which? claims, is the method of raising prices right before offering the products in a multi-buy deal, effectively rendering the deal worthless. But there are other examples as well. The UK supermarkets are currently hard-pressed by fierce competition, not the least coming from the German discount giants Aldi and Lidl. Plus from online shopping, of course. In such environments it might be tempting to step over the red line, but such behavior is probably less about greed than it is about survival. Which brings us to the second unfortunate event of the week, if you are a supermarket stalwart, that is. Tesco, the largest UK retailer, took a staggering $10,5 Billion write-off on April 22nd. That write-off put Tesco massively in the red for the year and with a loss of $9,6 Billion, Tesco could claim the not-so-glamorous title of top retailer on the list of the UK’s largest corporate losses in history. Massive write-offs are not uncommon in the corporate world, especially not when you have a new CEO (Dave Lewis), but this one is extra interesting. Tesco is the UK’s largest retailer and the country’s largest private employer, with 310,000 staff on the payroll. And with 3,330 stores, Tesco is simply one of the largest property owners around. Of the write-off, $7 Billion related to lower value of its properties ($5.7 for existing properties, $1.4 for not completing planned projects). Nothing strange about that; if volumes shrink (competitors and online to blame) and if price wars rage with no end on sight, your bottom line will suffer. And if the new normal is a slimmer bottom line, that will affect the value of your purpose-built retail property. The Big Question, however, is if we have hit the new normal, or if there still is some distance to go? Let us take a look at Tesco’s balance sheet and do a back-of-the-envelope analysis. Of $48.3 Billion in total assets, $30.6 Billion relates to property, $6 Billion less than last year. During the same period borrowing has increased with $2.1 Billion to $20.5 Billion. If Tesco had been a normal household, borrowing against property, the debt ratio would have increased from 50% to 67%. But of course that is an illusion. Supermarkets are not normal properties and precious hard to repurpose to something else than retail. What will happen if Tesco has another annus horribilis and needs to take an additional $10.5 Billion of the book? Then the company equity is gone (currently at $10.6 Billion) and they would need to raise more from their probably not-so-happy shareholders. But it is actually far worse. The market value of fully-owned property across the Tesco Group is estimated by the company itself at $33.4 Billion, representing a reduction of $11 Billion or a dramatic 25% drop, year-on-year. The hidden reserves for the fully-owned properties (the difference between what the properties are booked for in the balance sheet and what they fetch in the market) now stand at just above $4 Billion. What about the future? Price-wars are here to stay, and the Internet is not helping. Neither by making pricing blatantly transparent, nor by pushing sales online. To the latter – a rather small portion of food has gone online so far (something that is witnessed by the chart below). Chances are that it will not stay that way and that entirely new plays, such as food-as-infrastructure-betting Amazon Fresh, with deep pockets in search for market share, will cut fresh wounds. 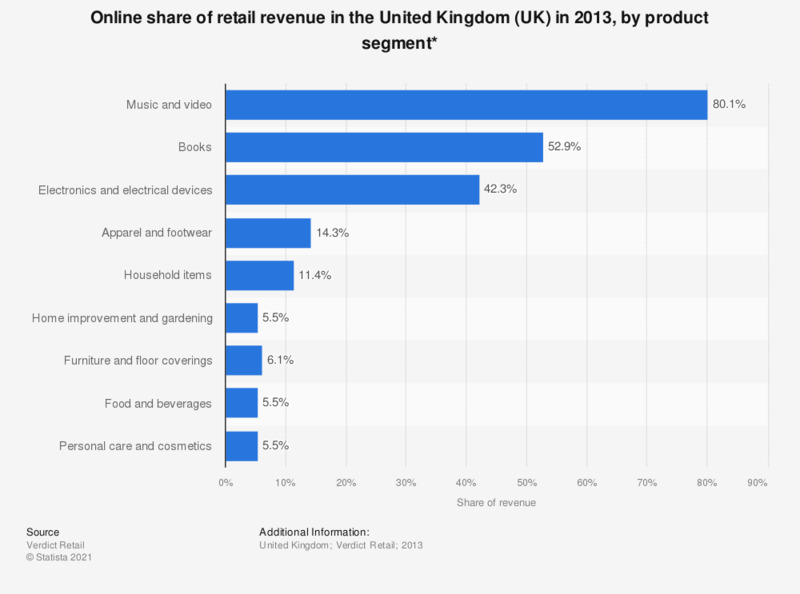 And let me just point out the obvious – it does not matter if Tesco or other traditional retailers will take a large portion of those online sales. They will in any case affect volumes and margins in the traditional stores. The allegations made by Which? might therefore not be such a major threat to retailers as it would seem. It is the trend behind and what it does to the balance sheets of retailers in the form of lower values of properties that are really hard to repurpose that is the real poison. A closing reflection: Tesco took a bitter pill last week, but they are not the only major property owner in retail. If more companies start to feel the effects of price wars and e-commerce in their balance sheets rather than at the bottom line, it might get ugly far faster than even the most change-minded amongst us thought.